Republican gubernatorial nominee Walker Stapleton was in Washington yesterday for the state funeral of his cousin, President George H.W. Bush. Over the course of the past several days, it has become apparent that Stapleton had a much closer relationship with the former president than many had understood, and that certainly speaks to Stapleton’s humility and down-to-earth nature. Pictures showed Stapleton as a child with the President, and even Walker’s own son were shown throughout. 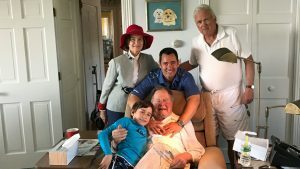 In one story relayed by Stapleton, he recalls that, as a six-year old, the elder Bush invited him on a fishing trip – the day that he was named Ronald Reagan’s running mate. Another picture showed Walker huddled with the senior Bush and baseball hall of famer Tommy Lasorda. Stapleton’s father was part owner of the Texas Rangers baseball team and his partner was George W. Bush. Fun fact: our state treasurer was actually on the field for Nolan Ryan’s final no-hitter. It is also apparent that Stapleton played tennis with George H.W. Bush, as Walker posted a picture on Twitter of the two of them after a match. Another fun fact: one of the two other players shown in that photo was John Newcombe, the three-time Wimbledon singles champion.